The firmware 6.00 reveals the possible existence of 8 models of PSP! The deciphering of 6.00 by our team has just revealed a very strange thing: there are traces of 8 models of PSP … not less. Our team is progressing on parsing firmware 6.00 and has made a fun discovery.If it does not revolutionize the world or even find an answer today, it will at least make us ask questions about the future of the PSP. Since December 2004 (date of the PSP in Japan) in March 2005 in the U.S. and in September the same year in Europe, the PSP has not ceased to evolve physically and technically without changing its main characteristics. Thus the memory doubled, screens have improved, autonomy is better and, finally, he left a PSP each year for three years now (PSP-2000, PSP-3000 and PSP Go). Each evolution of the PSP led at least one new function, but especially new PRX dedicated. Thus for the same function, the PSP-1000, PSP-2000 and PSP-3000 do not all have the same PRX file to run. (Editor’s note: there is still the PRX in common, but here we are talking about specific) c”est at the time of installation and depending on the model that the correct file is copied. 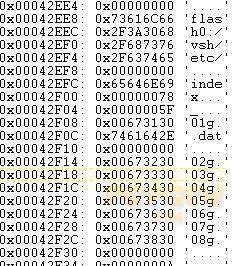 For the record, the files for the PSP-1000 has a prefix _01g those PSP-2000 _02g those of the PSP-3000 _03g and we had found in section 6.00 of the New Hidden: a new pops made appeared, those of the PSP Go have a nice _04g. Turning to the topic of the day, there is a file that is used to manage information of regions and models of the PSP which is called index_0xg.dat and today gives us valuable information. Indeed, the 6.00 firmware may be able to load a file that supports index_0xg.dat extensions _01g to _08g (For our english speaking friends : the firmware can have support to load a index_0xg.dat in this case its have support to _01g to _08g). 8 models of PSP … 4 is more than we already have. Funny is not it? Sony is therefore to integrate the ability to manage prx next 4 models of PSP. Oldest should remember that modules _02g had already appeared in firmware of the PSP-1000 before disappearing in an update next and finally to return with the release of the PSP-2000. We may be here in the same case: a discraction before precipitation Listed. Note that these numbers may be associated with prototype, debug versions or new machinery being tested. Not easy to know what to conclude on this subject, but anyway, Sony seems to see beyond his laptop and it is rather good news. Homebrew enthusiast and GBAtemp member darkchen has been busy developing a Game Boy Advance emulator for the Nintendo DS, and we’ve tried it! The result? Some extremely impressive work! How did darkchen manage to emulate the GBA given the hardware limitations of the DS? The clever guy used the extra power that the DSiPlayer (slot-1 media player) provides to get the extra juice needed to emulate GBA at a decent speed. Unfortunately of course, this means that this emulator will only work on the iPlayer. We’ve tried a handful of games using darkchen’s emulator and the results have been extremely impressive. The majority of games (even 3D intensive games) work extremely well with almost perfect video and sound output. There is a little bit of slow down in some games (using a frameskip setting of 2), but the results are astonishing for a first release. I didn’t even see a single graphical glitch. But, not only is the emulation side of things impressive, the emulator GUI itself is also very well done and offers a great number of useful and well implemented options such as save states, screenshots, frameskip and more. It even supports zipped ROMs, but has some issues with 256Mbit games when zipped. You can check out our hands-on video of the emulator above to see it in action for yourself. (We apologise for the poor video quality – watch in HQ on YouTube for a better picture). Well done to darkchen for a great piece of software and we hope you’ll continue to improve it. Also, please be aware that darkchen has not yet released this emulator publicly, so please do not request download links.